Frequently asked questions - Ibiza Villas 2000 - The best value villas in Ibiza! When you have chosen your ideal villa and we have confirmed the price and availability, you must confirm that you would like to book it by return email. Please be aware that in the busiest booking periods, villas get snapped up very quickly so don’t leave it too long between receiving the price and availability and confirming that you would like to book, or someone else may grab it first! When you have confirmed that you would like to reserve a villa, we will send you our Terms and Conditions and an online booking form with details of how to pay your 25% deposit. This is an automated communication email so if you do not receive it immediately, check your Spam folder as some email programmes will filter it away from your Inbox. We can give you up to 3 working days to pay the deposit to secure your chosen villa. If you really need more time to arrange your deposit, make sure you get in touch straight away and and we’ll do our best to help you, but this may not be possible in peak booking periods – especially on the most popular villas. Your booking is not confirmed until the deposit has been paid so do contact us immediately if you do not receive the Booking Form. Once the 25% deposit has been received the villa is yours! Details of how to make payments are including in your Booking Form. We accept payments via BACS bank transfer (directly into the L.P Rentals Ltd account) via a secure payment facility or by credit or debit card. You can also pay by Paypal or via our Euro account if you prefer. Please note that if you are paying in euros, exchange rates and bank surcharges will apply. Please ensure you include your name and Booking Reference when sending payments. All payments you send will receive an automated acknowledgment from us when we have seen the payment arrive. All payments will be recorded and updated on your booking details. You can check your booking at any time by clicking on My Booking, which appears at the top of every page of the website, and entering your Booking Reference. The balance of your villa rental is due 10 weeks before your date of arrival. We will send you automated reminders of payments due. If you are booking a villa within 10 weeks of your proposed arrival date, the full balance is due immediately. In some cases we can give you a little time to pay the full balance, as long as you contact us and pay an immediate deposit. The balance can be paid by the same methods listed above. The balance will include the Accidental Damage Waiver charge of £11.95 or equivalent in Euros per person. Throughout the booking process we will send you payment reminders and other information that you may find useful regarding your upcoming holiday. When your balance is paid we will send you directions to your villa in both English and Spanish and information about your check-in. Don’t forget to bring this information with you! If you are arriving late at night please contact us so we can make arrangements for an ‘out of hours’ secure key handover. Please feel free to contact us at any point throughout your booking with any questions or requests you may have. What is included in the villa price? The Property is cleaned for your arrival and is let furnished and equipped. The price includes bed linen and towels for use at the villa. The Accidental Damage Waiver is an additional cost which is charged per person and is added to your invoice. This is payable with your balance due 10 weeks before arrival. Also, the locally charged ECO tax which is payable on arrival in resort. Charges for the air-conditioning to be activated are payable in resort. Any pre-ordered food, drinks, extra mattresses / beds or other services that have not been paid with your balance, or that have been ordered after you have paid your balance, must be paid on arrival. Please see the FAQ’s below for more details of these charges. What is the Accidental Damage Waiver for? We have replaced the traditional large Security Deposit payment with an Accidental Damage Waiver that is added to the cost of your villa rental and paid with your balance. At Ibiza Villas 2000 we are constantly looking at ways to improve upon the service we offer our clients. The paying of large Security deposits is one area that our clients generally dislike and we have always tried to find a solution to this. Managing the collection and refunding of the security deposit is time consuming, and charging against the security deposit can lead to disagreements and misunderstandings, and many clients find it an unwelcome extra payment to finance on top of their holiday. With this in mind, we have replaced the traditional Security Deposit charge with an Accidental Damage Waiver (ADW) agreement. For a non-refundable charge of £12.95 or equivalent in euros per person, payable with your balance, clients will be covered for any accidental damages that occur during their stay in the villa. The ADW charge will cover you for any non-intentional breakages or damage to the Villa or its contents, up to the value of £1500 or €1800 per group. Any accidental damage or breakages must be reported while clients are in occupancy of the Villa. We are confident that Ibiza Villas 2000 clients will find this new Accidental Damage Waiver preferable to having to lodge a Security Deposit of between £600 to £1000. This far more manageable payment of £12.95 / 15.15 euros per person, provides peace of mind for the vast majority of our clients who treat our rental villas respectfully. IMPORTANT The ADW will not cover clients for willful, deliberate or malicious damages to the Villa or its contents, or for damages or breakages that are not reported during the clients’ occupancy of the Villa. It does not cover damage to the pool, or the cost of draining and refilling the pool due to broken glass or other items being found in the pool. The ADW does not cover fines from the police or other Island Authorities incurred for any type of anti-social behaviour, illegal activity or complaints arising from noise or disturbance. Any charges the company needs to make due to any of the above circumstances not covered by the ADW, will be invoiced to the Lead Client after departure. Full details of the Accidental Damage Waiver can be found in the Terms and Conditions on our website. The Eco tax is currently 2.20 euros per person per night and is collected on island by the Villa Management Company. This is a Government tax which can be changed at any point by the Ibizan authorities. Do I have to arrive on a Saturday? We can offer flexible arrival days subject to the availability in your chosen villa. Please contact us with your ideal dates and we will try our best to accommodate you. Can I stay for less than a week? Yes! We are one of the few villa rental companies in Ibiza to offer short breaks and long weekend bookings. Please contact us for prices and availability. Can I add extra beds? In some villas we can provide 1 or 2 extra mattresses for £100 each or extra beds for £150 each. It depends on the particular villa you are interested in. Please ask when you enquire about your preferred villa. You can only bring the agreed number of people with you for the stated capacity of the villa, including any pre-arranged extra mattresses or beds that you pay for. If your numbers change from your original booking, please advise us . You cannot bring additional people to sleep on sofas or share beds. We have the right to cancel your contract and remove your group if you deliberately exceed the capacity of the villa or the agreed number on the booking. Do the villas have safes and Alarms? All our villas are equipped with an alarm and a safety deposit box for cash, cards or small items. Please note; in most villas the safety deposit box is not large enough to store laptops, ipads, multiple mobile phones or other electrical items and we strongly advise that clients do not bring such items with them. 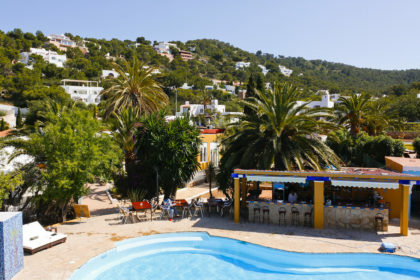 We have comprehensive information and guidelines on our Security page, to inform you of security risks in Ibiza, and how best to protect yourself and your belongings. Absolutely yes! We advise all our clients to ensure they have full coverage for their health and their belongings before they come on holiday. While thankfully, the majority of our clients enjoy holidays that pass without incident, accidents happen and crime does exist and illnesses can occur unexpectedly, so we strongly advise that you ensure you are covered by a comprehensive Travel Insurance Policy for your time in Ibiza. If you are planning on doing any kind of water sports, or hiring mopeds or quad bikes, make sure you are covered for any accident or injury that could arise from this. Do all villas have air conditioning? Many, but not all, of our villas have air-conditioning and this is listed in the description of each villa. If air-conditioning is available in the property, there is a charge of €20 per day for its use. This can be paid with the balance of your holiday, or locally on arrival. If your chosen villa does not have air-conditioning, we provide fans for the bedrooms. What type of music system is at the villa? All our villas have music systems that can be connected to an ipod either by an ipod jack, dock or Bluetooth. We do not allow the use or hire of any additional speakers, decks or any sort of amplified music system at the villas. We provide one bath towel per person and hand towels in every bathroom for use in the villa only. We do not provide beach towels as standard, however we can supply extra sets of large towels that can be taken to the beach, which can be rented for 25€ per pack of five large towels. We do not provide hairdryers at the villas. If required, you should bring your own along with an adapter plug suitable for European use. How do we collect our villa keys? We have our own office, cafe and Bag Drop in Playa den Bossa, near the airport, which serves as an excellent ‘hub’ for our clients and for any other island visitors who want to make use of our services. It is conveniently located on the main thoroughfare into the centre of Playa den Bossa and only a few minutes from the airport. This is where you will check-in, complete your Villa Registration form, pay the local ECO Tax charge and collect the keys or the keypad code to your villa. We also run our transport service from here, so you can book airport transfers, private taxis and we also run daily shuttles to Ocean Beach Club and Mambo in San Antonio. You will be sent a Google Maps link to the location with your villa directions, when you pay your final balance. The location is also available on our ‘Cafe and Bag Drop’ page. When can I check into my villa and when do I have to check out? Normal check in time is 4pm on the day of arrival. Normal check out time is 10am on the day of departure. We may be able to offer an early check in or late check out, however we cannot confirm this until the week before arrival and charges will apply. How often is the villa cleaned? The villa will be cleaned ready for your arrival. We do not expect you to scrub the villa before you leave at the end of your holiday but we do expect it to be left in a tidy and hygienic condition. If you are staying for more than a week (ten days or two weeks) the cleaners will attend midway through your holiday to change your bed linen and towels. Can I book extra cleaning? If you would like the help of a cleaner during your stay or before you vacate please contact your Villa Rep or call the Operations Team on 0034 650 082 157. If you would like to pre-book a cleaner to help during your stay please email bookings@ibizavillas2000.com The cleaners cost 25€ per cleaner per hour for a minimum of two hours per visit. Can I store my luggage on the day I arrive or leave? We have our Bag Drop office in Playa Den Bossa wher you can store your luggage for just 10 euros per bag. Have a look at our Luggage Storage page and email us with your requirements. Can I book a transfer from or to the airport. We can organise transfers for you at very competitive rates, either with our own licensed drivers or with one of the fully legal and licensed transfer companies we work with. Please contact us at transport@ibizavillas2000.com to get a quote. Remember that only correctly licensed drivers or the white Public Service taxis are allowed to pick up or drop off at Ibiza airport. Do not risk your transit to or from your villa by using an unlicensed taxi as this is illegal and you could find yourself stranded at the side of the road with your bags and could even compromise the security of your villa. Most of our villas are situated in convenient locations where it is easy to get around by short taxi journeys or public transport. However we do recommend you consider hiring a car to make life easier for shopping trips etc, or simply to enjoy some of the more ‘out of the way’ beaches and villages of the island. Check out our Car Hire page to get a quote from our trusted car hire partner, Moto Luis. You can even book a car during your stay and have the car delivered to and collected from you villa if you think you might only want a car for a couple of days. Moto Luis can also provide scooter and quad bikes for you to use to explore the island. Can you help me book a taxi? In your villa information book there will be list of the telephone numbers for the local licensed taxi services. There will also be information of your location to help you book a taxi. However, please be aware that during the peak season the taxi services get very busy and the operators can occasionally be less than patient with non-Spanish speakers. Due to the volume of clients we accommodate during the summer we cannot help you book local taxis, but we can help you organise transport with our own driver when available, or with one of our trusted Private transport partners. Please give us as much notice as possible as normally these services have to be pre-booked. Can I have shopping delivered to the villa? Due to the volume of clients we accommodate during the summer we can not offer an individual shopping service, however we have Pre-arrival food and drink arrival packs that should cover your basic requirements and are always very popular particularly with clients arriving late at night. The pre-arrival shopping packs are designed for approximately 8-10 clients, but you can order multiple packs if you are part of a large group, or you would like your supplies to see you through your holiday. We have small children with us; what can you provide? We can provide cots and highchairs free of charge, however these are subject to availability so please let us know well in advance if you require them. If none are available for your dates, we can recommend a company that rents such items. We do not provide cot linen. You will have to provide your own bed linen for your child’s cot. If you are planning any days or nights out, when you will require the services of a babysitter or Nanny, we can put you in touch with some trusted childcare providers on the island, many of whom are personally known to us and who have looked after our own children over the years. In high season, and on popular club nights, child carers are quickly booked up, so we advise you to contact us as soon as possible if you have specific dates when you will require child care. Prices vary according to the age of the child / children, the number of hours and time of day or night. As a guideline, you can normally expect to pay at least 20€ per hour for a minimum of four hours. Are there sun loungers around the pool? Yes, there are sun loungers provided for each guest up to the normal capacity of the villa. If you have booked extra beds or mattresses for additional guests there may not be enough sun loungers for the additional guests, however where possible we will try to assist with this subject to availability. Can I hire decks and play music at the villa? In recent years, the laws in Ibiza pertaining to anti-social noise and loud music at residential properties have become very strict. for this reason, we categorically prohibit clients from bringing or hiring decks or amplifiers for use in our villas. All our villas have music systems that can be connected to an ipod either by and ipod jack, dock or bluetooth. You can play music at a reasonable level throughout the day but must ensure the volume can not be considered a nuisance or a disturbance to any neighbours. We ask that our clients are particularly considerate during the typical ‘siesta’ time of 2pm to 5pm, when local Ibicencos will often have their daily nap before heading back to work for the evening. Music and outside noise must be at a low-level after 9pm. After 11pm there must be no outside music or vocal disturbance. You cannot have after parties, weddings, or any type of gathering without permission. If anyone hears noise they are not happy with, they have the right to call the police. If the police come they will measure the noise and count the number of people in the villa. If either parameter is considered excessive you will get a very large fine. It can be anything from €2000 for a general disturbance, and the worst case scenario is a fine of up to €10,000 with an arrest and eviction for a big party. Please note; should such a fine be levied by the local authorities, we will always pursue the Lead Client through the Small Claims court to settle the incurred costs. Can I invite other people to the villa during my stay? We rent the villa accommodation to you for the sole use of the agreed number of people on your booking. We understand that during your holiday you may be socialising with other friends or holiday-makers and generally it is not a problem if you have visitors for a meal or drinks as long as you do not exceed the contracted standard capacity of the villa and do not cause a disturbance to any neighbours. You cannot have more than 25 people in a villa without letting the Town Hall know and getting a valid Event License. In addition to these guidelines, we strongly advise that you do not allow anyone you don’t know to come to your villa, either socially or for the reason of providing goods and services. In the summer months many adhoc ‘concierge’ agents set up business on the island offering the delivery of club tickets, drinks services etc to villas. Should you decide to purchase club tickets, products or services from any third party agent, we cannot stress strongly enough that you should arrange to meet them elsewhere and not invite them to your villa. Bear in mind; if you buy tickets to a club night from an un-registered ticket agent, you have just given them a very clear idea of when your villa is going to be empty! How can I contact someone from Ibiza Villas 2000 during my stay? Your information book in the villa, as well as the pre-arrival information we provide you with, will have clearly marked contact numbers for the Villa Rep team and the Operations & Maintenance team in case you have any need to contact them during your stay in the villa for any kind of advice, information or request for services. There will also be a list of Emergency contact numbers to call. If any kind of problem or dissatisfaction with your accommodation arises during your stay, please contact us as soon as possible so it can be resolved. Any problem or dissatisfaction you may have will be documented as soon as it is reported and our team will endeavour to resolve the issue as quickly as possible. Please be aware that we can not address complaints retrospectively if they have not been reported to us and documented whilst you are in occupancy of the villa.